BREAKING: AUSTRALIAN BUS-BODY BUILDER Coach Design officially handed over its 1,000th vehicle to new owner Cooma Coaches, with the celebration unit featuring the nation’s first 500hp Euro 6c chassis - supplied by MAN, distributed by Penske Commercial Vehicles - at a private function today, in Acacia Ridge, Queensland, it’s reported. Cooma Coaches’ Trevor Heise takes delivery of the special coach - the 1000th Coach Design body on Australasia's first 500hp Euro 6c chassis, from MAN. "Today is a great reflection of a lifetime of hard work. And it’s great to be part of a fantastic industry with fantastic people," said Chryss Jamieson, CEO Coach Design. The Coach Design quadruple-figure milestone comes after its first delivery in 1992. Cooma Coaches’ Trevor Heise and Chris Fogg took delivery of the special coach, which is to then make its way south on a 13-hour journey from Queensland to Cooma, NSW, the following day. Daubed in Cooma Coaches livery, the base colour [is] in light grey and there are three strips down each side: yellow, red and dark grey - all clear over base. "The finished coach looks fantastic," said Ashley Jamieson, a part of Coach Design’s management team, confirming to ABC magazine that’s there’s been a lot of excitement around at the company during the build-up for this 1000th bus - the latest Alpine body design. "Job 1,000 is our 10th vehicle for Cooma Coaches. With Trevor’s proximity to the snow the roads that the vehicles use are often salted, so we go to a lot of preventive measures to stop corrosion and rust. Things like stainless steel luggage bins. We also fit special vents on the inside to defuse the air for the climate control to stop fogging," he explained. And to commemorate the bus, a jeweller was commissioned to make a special plaque now fitted to the vehicle. "Our first vehicle was delivered in 1992. A lot of our staff have been working here for many years. We even have a couple of guys that started when our build number was in two digits, so for them and everyone else, too, there is a big sense of accomplishment," he explained. "One thousand vehicles is a good time to reflect on our achievements, but it is also a good chance to look into the future and think about how we can keep putting out quality vehicles with competitive prices." Clint Stoermer, national sales and service manager - MAN Bus, Penske Commercial Vehicles said: "This is MAN’s latest and most powerful Euro 6c, three-axle coach chassis to arrive into the Australian market!" "The RR4 CO26.500 coach chassis is equipped with MAN’s Euro 6c, 12.4-litre D26 in-line, six-cylinder engine, producing a huge 500hp at 1,800rpm and 2,500Nm … from as low down as 930rpm. Combined with a 12-speed Tipmatic transmission and MAN hypoid axle, the drive provides more than enough power reserves to flatten any mountain!" he added. "Not only is the new Euro 6c D26 engine more powerful, it is also expected to provide a fuel-consumption saving compared to its predecessor. "Add to this an incredible 140,000km or 18-month engine oil drain interval and you can start to see a clear cost benefit when operating an MAN. "Safety is also a key factor in high-speed touring coaches. In this respect the MAN RR4 is unequalled. Not only is it equipped with EBS and ESP, which includes roll-over protection (ROP), additional driver assistance features commonly found in high-end passenger cars, such as adaptive cruise control, tyre-pressure monitoring, lane guard, and emergency brake assist, are all offered as standard." Coach Design founder Chryss Jamieson was an apprentice coach builder in 1970 after leaving school at the age of 16. After serving six years learning the trade with Brisbane City Council, he moved on to a position with a prominent Brisbane coach builder specialising in luxury five-star coaches. After gaining a huge amount of experience in luxury coach building, in 1986 the "timing was in place to follow his dreams of creating his own coach building business," it’s stated, with his business partner, Desiree Jamieson. According to the company, it survived initially doing bus and coach repairs, spray painting and turning old coaches into mobile homes. As the demand for new bus and coaches increased in the early 1990s, Coach Design took new and innovative designs to market to take out 1992 Coach of the Show award at the prestigious Sydney Bus & Coach Show. Increased demand would see the company produce its first 4x4 off-road safari tour bus, it’s reported. 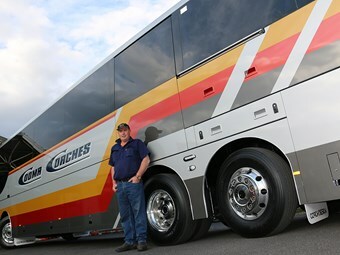 Further success in future years saw Coach Design win Coach of the Show awards at the Sydney Bus & Coach Shows five times in a row, the company states. MAN Truck & Bus, with headquarters in Munich, Germany, is one of the leading international suppliers of commercial vehicles and transport solutions in Europe, with production plants in three European countries as well as in Russia, South Africa, India and Turkey. As well as new and used trucks, coaches, rural and municipal buses and all you need in terms of service, support and funding, MAN Germany also operates its own trucks and buses and manages vehicle fleets. In Australasia, the Penske brand is proudly represented in through leading on- and off-highway business concerns including Penske Commercial Vehicles, Penske Power Systems and Penske Truck Rental. It distributes commercial vehicles from Western Star Trucks, MAN Truck & Bus and Dennis Eagle, as well as diesel and gas engines, and power systems from Detroit, MTU and Allison Transmission, with related parts and service interests. All of these local brands form a part of Penske Transportation Group International, the local holding company for Penske Automotive Group, which is a Fortune 500 company, operating automotive and commercial vehicle dealerships across the United States and Western Europe.